According to data and articles published in the last few years, only about twenty percent of jobs are filled through external hiring. This means that around 80% of available jobs, the vast majority, are never posted externally—underscoring the immense value of networking for those looking to advance their career. A combination of personal and online networking will yield the most effective results. Watch for all of the information sessions, site visits, special programming, workshops, and special events happening at the Rotman Commerce Career Centre. Get involved with associations, events, and clubs that resonate / relate to your field. Set up touch points with contacts within the industry. These can be information coffee chats or introductions, or more structured info sessions. Register for one of the many career fairs happening in and around Toronto. It is a great practice to test your personal brand, and a chance to meet potential employers in person. Log in to the Rotman Commerce Portal > Career Centre > Resources to access useful resources on job search strategy and pitch techniques. When cultivating your personal network, it is best to start with your immediate circle. Speak to your relatives, friends, former colleagues, classmates, peers, and past Rotman Commerce alumni about your goals and areas of interest. Inquire with members of your network about individuals they may know in your target industry/companies/roles. Conduct some preliminary research online before connecting to ensure that you are adequately prepared and can guide a specific line of conversation. Compile a list of everyone in your circles who could possibly serve as a contact. Sources may include classmates, alumni, colleagues, former managers, family, friends, professors, professional organizations, volunteer/community involvement, and social media. Don’t restrict yourself—at this stage, you need to cast the widest net possible. Approach networking opportunities with a goal and a sense of strategy. 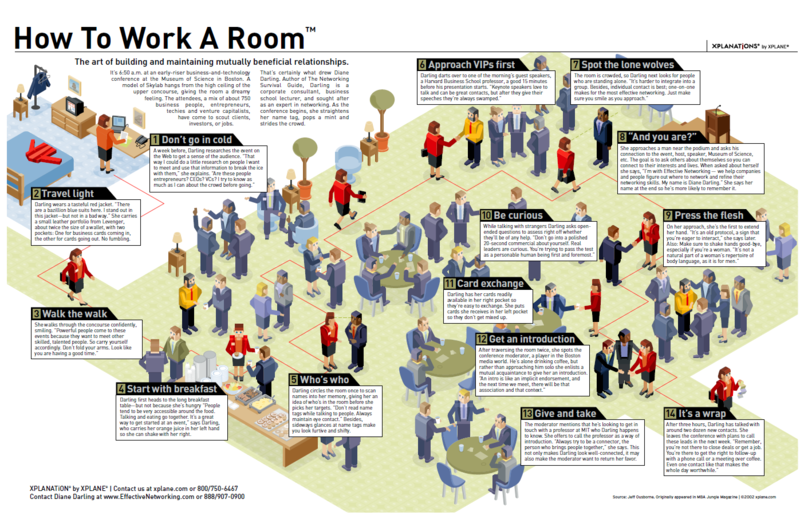 Before you enter a business conference room, a dinner party, or group event, you need to have done your homework. Find out who will be attending, and conduct research on their backgrounds and prepare a few questions in advance. Make sure that you have business cards and that you’re comfortable delivering your networking pitch in a variety of settings. It’s important to keep track of all your potential opportunities, so it’s a good practice to keep a record of all your networking. This may seem obvious, but often this type of tracking is done unsystematically. To avoid confusion or potentially embarrassing situations, keep track of all contact information, job title, circumstance of the meeting, and any subsequent conversations. Remember that networking is not necessarily goal-driven—it may not immediately result in a position. Rather, networking serves to cultivate and steward your professional connections, increasing the likelihood of acquiring a job through your network at some point in the future. Offering to help someone often builds a stronger relationship, and there is a greater likelihood that they’ll want to assist you in turn. Networking starts with who you already know. Your peers and classmates can serve as a good first point of contact to learn more about a specific industry/company/role or job function. Make sure to leverage your existing network as part of your cultivation. It is always a good practice to send a thank you note after a meeting. Tell your contact how much they helped you. Even the most high-level executive likes to feel appreciated. Mention something that was said during the conversation to show that you were listening and consider sending information that may be of value to them (industry-related news, conferences, articles, etc.) on an ongoing basis, to stay in touch. Don’t neglect those you have already met with, and take the opportunity to stay connected with important people in your network. Most networking events offered through the Career Centre are designed to help students (typically in their upper years) connect with industry professionals in fields related to their program (the career fields of these events varies year to year). You’ll be able to get the inside scoop from professionals working in the field, representing a wide range of firms in different sectors. You’ll also have the opportunity to practice your networking skills, which will be a valuable experience as you move forward along your career path. Assess the event. Be selective in the events you attend. Make sure to research the guest list and companies that will be present. Summarize yourself. Know how you’ll introduce yourself in 10 seconds or less, but don’t just give your title, describe what you do. Give people context about why you’re there. Scope out the room. These are great places to strike up a conversation with a person who isn’t already talking to someone. Scan the crowd to see if you know anyone. If you don’t see any familiar faces, start off approaching people who are standing alone. Its an easy way to engage someone, it’s a considerate welcoming gesture that will be remembered. Keep moving. If you’re at the event for an hour, try to talk to at least three people. Don’t overtake 1 person’s time for the whole event. Follow up promptly. Prioritize with whom you want to follow up and don’t wait too long, Be sure to email or connect with the people you met at the event on Linkedin within a few days. Remember: “ABC” really means Always Be Considerate. Log on to the Rotman Commerce Portal > Career Centre > Resources for more networking resources. In the workplace it’s very natural to develop relationships with people; and sometimes those relationships can last a lifetime. It’s important to you personally and professionally to have work-peer relationships, even if they don’t last beyond this job. One of the advantages of being a Rotman Commerce student is your access to our extensive alumni network: many of our grads work right here in Toronto at some of the country’s most prestigious firms. Our Alumni Relations Office organizes several events and programs that allow current students to learn from our alumni’s expertise. In our Alumni Mentorship programs, we match alumni with students who have common interests and career goals. Mentors are encouraged to share their expertise and provide advice. Note that Rotman Commerce alumni should NOT be your first point of contact for networking. Put simply, Rotman Commerce alumni could be decision-makers at their respective organizations. You need to create the best first impression by demonstrating you’ve done your homework before reaching out. To find out where Rotman alumni are working, LinkedIn offers a powerful built-in tool to search for alumni by university under Connections -> Find Alumni. Students in their graduating year may submit a request to join the Rotman Alumni Network (Official alumni group) on LinkedIn. Coffee chats are informal meetings with potential decision makers, managers and key insiders within your target companies, these conversations will allow you to learn more about roles(s) from employees’ first-hand experience and to see if a company’s particular culture is a good mutual fit. Setting up a coffee chat is a good first step for any new connections you have acquired through other channels, and can be excellent practice for your networking pitch. Alumni Coffee Breaks match volunteer alumni with a small group of students (from any study year) for informal conversation. Alumni are encouraged to share experiences and provide general guidance. Treat your networking coffee chats as you would any meeting – meaning – come prepared! You should be well-informed enough about the company to either ask questions or have a conversation that pertains to current events in the news (announcements, mergers, acquisitions, divestitures, etc.) but be aware of what your contact can realistically answer/discuss based on their position in the organization. The point is to leave that person with the impression that you took the time to educate yourself about the company before the meeting. Take notes during and/or after each meeting so you can recall and follow up on any specifics later (both professional and personal) and follow up with a LinkedIn connection request. Register for an Alumni Coffee Break through the Rotman Commerce Portal. Rotman Commerce Student Associations will often bring in guest speakers and alumni to share their industry experience. Check out Board of Trade events, professional associations and industry conferences for other networking opportunities. Charity Village has an excellent list of professional associations. Join the Rotman Commerce E-Visors network and offer to take an alumnus out for a coffee! After meeting with a networking contact, it is a good practice to send a quick thank you letter or email. This imparts your gratitude to that contact, and ensures that you are keeping the lines of communications open past the initial meeting. Refer specifically to the content of your conversation and make sure to express your appreciation—everyone, no matter the level of their career, likes to be thanked for their time and expertise. The challenging courses offered by the program give me a broader perspective of how I can bridge the gap between the world of academia and the world of work while the very talented and competitive Rotman students constantly remind me that there is more to success than grades.